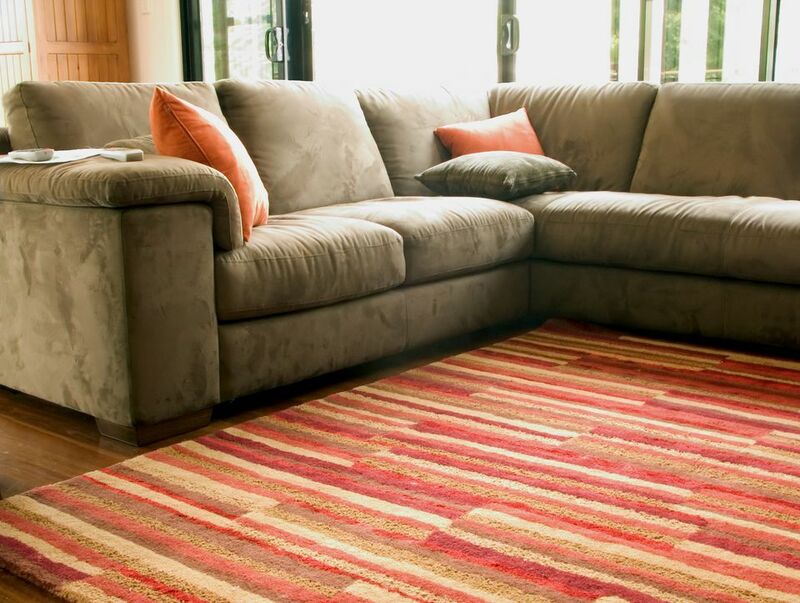 Follow these simple tips to keep your carpet or area rug at its best. Have you ever rearranged your furniture, or perhaps swapped it out for a new piece that wasn’t exactly the same size, and noticed indentations left behind in your carpet? To get rid of indentations and bring your carpet back to life, place a single ice cube in the indentation and allow it to melt. Once it has melted, brush the carpet fibers with your fingers to revive them. Do not use a scrub brush; this will be too abrasive and harmful to your carpet! Finish by vacuuming the area, once the carpet is fully dry. Voila! You no longer need to feel like your furniture is chained to the spot. Tip: when moving your furniture, be sure not to drag it across the carpet, or it can cause ripples. Already have them? Learn how to get the ripples out of your carpet. Area rugs laid over hardwood can “protect” the wood underneath by shielding it from light and air. After a length of time, the wood around the rug has changed, but when the rug is removed, the color of the wood in that area remains closer to the original wood color. To minimize this effect, remove your area rug(s) when you plan to be away – such as when you go on vacation. Roll up the rug and place it out of the way, and leave your blinds or curtains open. This will allow the light and air to get to the wood, thereby reducing the dramatic effect of the color change. That way, when you want to change your area rug or remove it altogether, your hardwood will be more evenly colored. Be sure to roll up the pad underneath the rug as well. Read more on the best type of area rug pad. We tend to mostly walk along the same pathways in our homes: for example, we take the shortest, most direct route to get from point A to point B, and typically walk down the center of the hallway. This means that certain areas of our carpet or rug get walked on more than others, and therefore, begin to show sign of wear sooner. Minimize this occurrence in area rugs by spinning them 180 degrees every 6 months – the same way you may do with your mattress. Rotating your rug helps to create even wear across the rug, thus reducing the appearance of having traffic lanes across your carpet. Learn how to choose the best rug size for your room. Stairs are the highest traffic area of any home, so it goes without saying that the carpet on the stairs will age much more quickly than the carpet in other areas, and will need to be replaced sooner. However, there is no guarantee that the same carpet will be available in five or ten years’ time, in order to match the rest of the areas. So, buy it now! Purchase double the amount of carpet you need for your stairs, and keep the second piece rolled up in a dark, dry area. Stairs don’t require a lot of carpet to cover, so the added cost will not be huge and will save you down the road, as you won’t have to replace all of your carpet just because your stairs are looking worn. Need inspiration? Check out these modern carpeted staircases. This tip is probably not news to most people but bears mentioning on this list. It’s fairly common knowledge that baking soda absorbs odors, and it’s a tip as old as time: sprinkle some baking soda all over your carpet when you need to eliminate odors (from pets, smoke, cooking, etc.). Leave it on for a couple of hours, and then vacuum your carpet thoroughly to remove all of the baking soda, and the odor along with it. For more tips on caring for your carpet and removing carpet stains, check out these articles.